I’d ask for a 28-hour day, but that just sounds exhausting. § December 15th, 2017 § Filed under blogging about blogging is a sin, pal plugging Comments Off on I’d ask for a 28-hour day, but that just sounds exhausting. 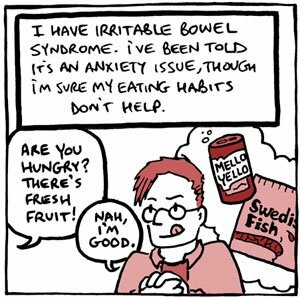 So pals Cathy (she of the medical mini-comics) and Andrew (he of the nuclear-powered nostalgia) have joined forces to CONQUER THE WORLD…and also to bring you this comic strip about one of Andrew’s…adventures, shall we say. It’s a great piece by a couple of my favorite creative folks, and I hope y’all enjoy it, too. I do intend on going back and addressing some of your comments and suggestions from the “who am today’s superstars” post from Monday. The lead-up to Christmas and subsequent lessened spare time have prevented me from really getting going on my responses. Plus, I have an examination of an Amazing Heroes article from 1981 that needs to be written. You know, cutting edge stuff. And oy, my Patreon…at this point, I may just have to call it “Swamp Thing-a-Thon Season 2” once I get that article about issue #8 up. Anyway, the holiday season has kinda put me under the gun this year, so hopefully I’ll be able to free up a little more typin’ time once Santa’s finished his rounds. And I gotta make time to go see the new Star Wars movie. Look, I gotta have priorities.